From North to South, East to West, we are all connected by a vast body of water known as the ocean. This year’s theme for World Ocean’s Day is “Healthy Oceans, Healthy Planet,” and is celebrated on June 8th. This day is meant to celebrate the importance of the world’s oceans and how vital they are to the environment. Groups and organizations across the country are participating in various activities to educate the public on ocean conservation and ways they can help keep the ocean healthy for future generations. Water is the source of life and is vital to mankind and animals worldwide. If you haven’t already, be sure to check out our new film Wild Africa 3D as you are taken on water’s journey throughout the enchanted continent of Africa. Learn how life is created and sustained by water as you cascade along raging rivers or travel above the plains on the largest theater screen in the state of Texas. In honor or World Ocean’s Day we would like to recognize some of our dedicated Moody Gardens divers that recently completed a week-long technical diving research cruise. 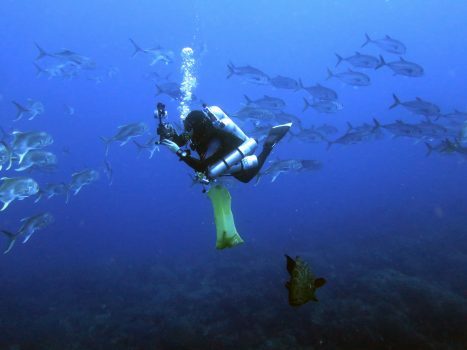 During this time they explored mesophotic coral reefs over 100 miles off the Texas Coast in the Flower Garden Banks National Marine Sanctuary and outlying coral banks. Members of the Voss Lab at FAU Harbor Branch and collaborators from Florida FWC leading the cruise aim to provide data that will help us better understand and protect coral ecosystems using a suite of molecular techniques. These studies are important for effective management strategies because these reefs are typically deeper than 30 meters, and are largely an unknown frontier that provides habitats to commercially important fish species and coral larvae for recovery of shallower reef areas. We have included the cool video link below for your viewing pleasure!